Hartley oscillator was invented in 1915 by the american engineer Ralph Hartley while he was working for the Western Electric company. The original design was tube based and he got a patent for it in the year 1920. 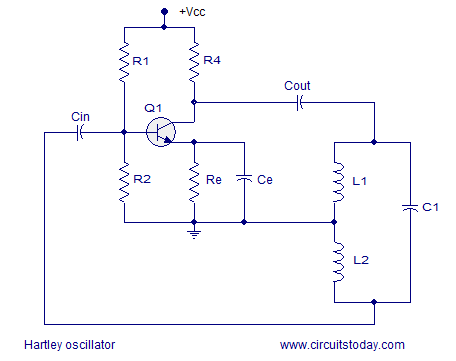 In a Hartley oscillator Â the oscillation frequency is determined by a tank circuit comprising of two inductors and one capacitor. The inductors are connected in series and the capacitor is connected across them in parallel. Hartley oscillators are commonly used in radio frequency (RF) oscillator applications and the recommended frequency range is from 20KHz to 30MHz. Hartley oscillators can be operated at frequencies lower than 20KHz, but for lower frequencies the inductor value need to be high and it has a practical limit. The circuit diagram of a typical Hartley oscillator is shown in the figure Â below. In the circuit diagram resistors R1 and R2 give a potential divider bias for the transistor Q1. Re is the emitter resistor, whose job is to provide thermal stability for the transistor. Ce is the emitter by pass capacitors, which by-passes the amplified AC signals. If the emitter by-pass capacitor not there, the amplified ac voltages will drop across Re and it will get added on to the base-emitter voltage of Q1 and will disrupt the biasing conditions. Cin is the input DC decoupling capacitor while Cout is the output DC decoupling capacitor. The task of a DC decoupling capacitor is to prevent DC voltages from reaching the succeeding stage. Inductor L1, L2 and capacitor C1 forms the tank circuit. When the power supply is switched ON the transistor starts conducting and the collector current increases. As a result the capcitor C1 starts charging and Â when the capacitor C1 is fully charged it starts discharging through coil L1. This charging and discharging creates a series of damped oscillations in the tank circuit and it is the key. The oscillations produced Â in the tank circuit is coupled (fed back) to the base of Q1 and it appears in the amplified form across the collector and emitter of the transistor. The output voltage of the transistor (voltage across collector and emitter) will be in phase with the voltage across inductor L1. Since the junction of two inductors is grounded, the voltage across L2 will be 180Â° out of phase to that of the voltage across L1. The voltage across L2 is actually Â fed back to the base of Q1. From this we can see Â that, the feed back voltage is 180Â° out of phase with the transistor and also the transistor itself will create another 180Â° phase difference. So the total phase difference between input and output is 360Â° and it is very important condition for creating sustained oscillations. Frequency of the Â Hartley oscillator. C Â is the capacitance Â of the capacitor C1 Â in the tank circuit. L = L1+L2, the effective series inductance of the inductors L1 and L2 in the tank circuit. Here the coils L1 and L2 Â are assumed Â to be winded on different cores. If they are winded on a single core Â then L=L1+L2+2M Â where M is the mutual inductance between the two coils. The typical arrangement of a Hartley oscillator using opamp in shown in the figure above. 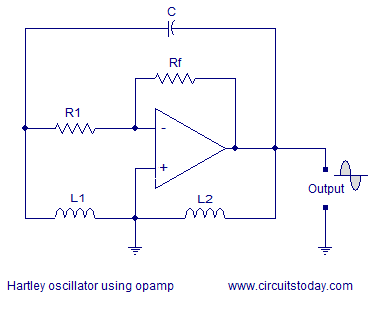 The main advantage of using opamp is that the gain of the oscillator Â can be individually Â adjusted using the feedback resistor (Rf) and input resistor (R1). The opamp is arranged in inverting mode and the gain can be expressed by the equation A=-Rf/R1.Â In transistorized versions the gain will be equal to or faintly greater than the ratio of L1 and L2. In opamp version the gain is less dependent on the tank circuit elements and so it provides better frequency stability. The working principle and frequency equation Â of the opamp version is alike to that of the transistor version. Very good Circuit. I got it this working with a 9V cell and it produced a pretty clean sine wave of about 1 MHz that could be seen on a scope, and heard by placing an AM radio next to the circuit. In answer are not current pls give the correct value…. main parts of an oscillator..?? What are some interfaces of Hartley? yes where is value of components and give us output of that circuit.